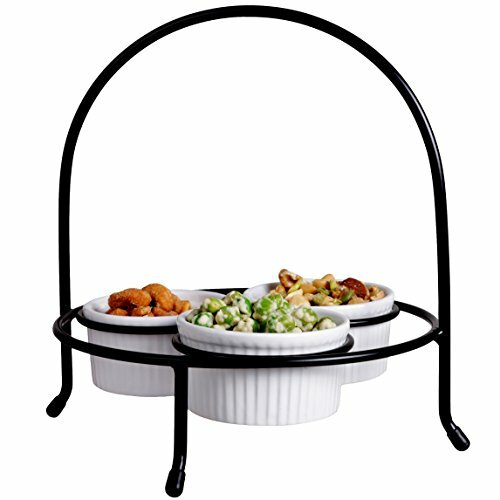 This 3 section condiment set includes: 1 pc black powder coated caddy stand and 3 pc white ceramic ramekins. Dimensions: 9-1/4" x 9" x 8-7/8" H, Ramekins: 3-3/8" Diam. x 1-3/4" H, 3 oz capacity. Functional 3 section condiment set for entertaining or everyday use. Perfect for serving appetizers at home or in your restaurant. Hand wash recommended for black powder coated caddy stand. Ceramic ramekins are dishwasher, oven, and microwave safe.